What does kata give to judo as an art? A lot of things, but the one I'm thinking about today is - Kata gives your instructor a syllabus and a set of suggested drills - sort of like a set of bullet points on what to teach when. Nage shows some suggested possible defenses against three of the most common attacks experienced on the street - an overhand right to the head, a two-handed chest-level grab/push, and an encircling low grappling sort of hug. Three things that can easily get overlooked if we concentrate too much on how to win tournaments. Nage shows a wide range of technical responses - hand throws, hip throws, foot throws, and two kinds of sacrifices. This is a huge technical range that is easily enough to stretch any instructor into teaching beyond his tokuiwaza. Nage shows some lessons about how to vary throws based on uke's resistance - for instance, the ukigoshi-haraigoshi-tsurigoshi sequence. Nage shows some lessons about good ways to teach particular actions - for instance, the side-to-side okuriashi action is a good drill to get folks working on okuriashi, but it seems to never occur that way in randori. In randori it happens stepping around the corner, but it seems to be harder to teach stepping around the corner into okuriashi to beginners whereas the side-to-side okuri is an easy introductory drill. Nage teaches uke how to handle a wide variety of falling actions. The list could go on and on. So, Nage no kata is like a set of bulleted reminders to the teacher about what to teach and how to try teaching it. 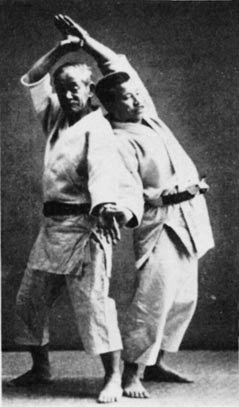 Uke and tori must develop a good perception of ma-ai, a smooth, graceful tsugiashi, and an understanding of how to deliver and receive a deceptive attack to the face - so the 3-step approach works as a drill. Tori is learning to yield out of the way and disrupt uke's timing and balance. Uke and Tori are both learning a very common reversal for a rear attack and tori is learning how to diffuse that reversal. Teach how the technique develops during the transition from hamare to kumi judo. Teach the technique from both points of view - uke and tori. Make sure that the technique fits the Ju ideal of judo. Teach how to reverse it or the weaknesses where the technique can be broken. Teach how to recover a broken technique. Teach uke how to safely submit when he is truly compromised. Once you have taught one good (ju-ish) technique from both perspectives(uke and tori), and how to counter it and how to counter the counter and how to submit you now have all you need to start doing randori!